The Fundamentals of Machine Design Department was created in 1988 when two departments, Theory of Mechanisms and Machines and Machine Parts, were merged into a single unit. Prudnikov Aleksandr Petrovich, PhD in Engineering, Associate Professor (2016 – present). The Department has a high scientific potential. In the academic year 2018-2019 the Department comprises two Doctors of Engineering, six PhD in Engineering, two assistant lecturers. The educational process is carried out according to educational programs of the Republic of Belarus and the Russian Federation. The Department offers courses of studies leading to the PhD degree. Transmission mechanisms with motion transmission components. The research supervisor of the direction is Doctor of Engineering Aleksandr Mikhailovich Dankov. In this field, one doctoral and one PhD theses have been defended. Development of compact drive systems based on transmissions with intermediate rolling bodies. The research supervision of this direction is carried out by Doctor of Engineering Mikhail Evgenievich Lustenkov. In this field, one doctoral and one PhD theses have been defended. Development and research of energy-saving worm gears of rolling. The research supervisor in this area is PhD in Engineering, Associate Professor Nikolai Ivanovich Rogachevsky. He has created a number of worm gears with increased efficiency. 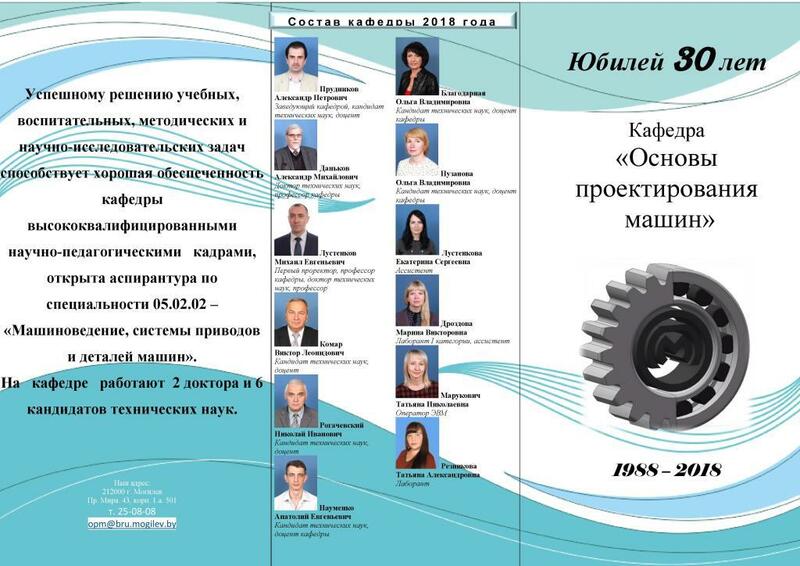 Over the past 15 years, research teams headed by Doctor of Engineering A. M Dankov, Doctor of Engineering M. E. Lustenkov and PhD in Engineering N.I. Rogachevsky have participated in implementation of tasks of state research programs and have created a number of transmission mechanisms that meet international standards. So far, nine monographs, seven textbooks and manuals prepared by the members of the Department have been published. Due attention is paid to the research performed by students. Papers jointly written by teachers and students are published in scientific journals. Every year at least two student papers are submitted for participation in the Republican competition. The two works submitted for the 2017 competition were awarded 1-st category prizes (research supervisors N.I. Rogachevsky, M.E. Lustenkov). The highly qualified personnel, the facilities available at the Department and the organization of the educational process allow the Department to be proud of their contribution to student training carried out at the University.